While there is much scholarship about the internment of Japanese and Japanese Americans during World War II, there is not much about the Hawaiʻi internment experience. This guide attempts to pull together published materials and online resources. The Japanese Cultural Center of Hawaiʻi has tallied 1,330 Japanese nationals and Japanese Americans from Hawai'i interned during World War II. Of these, 370 were incarcerated at Honouliuli at some point; many more were sent to mainland camps. See the PDF attached below for additional details. 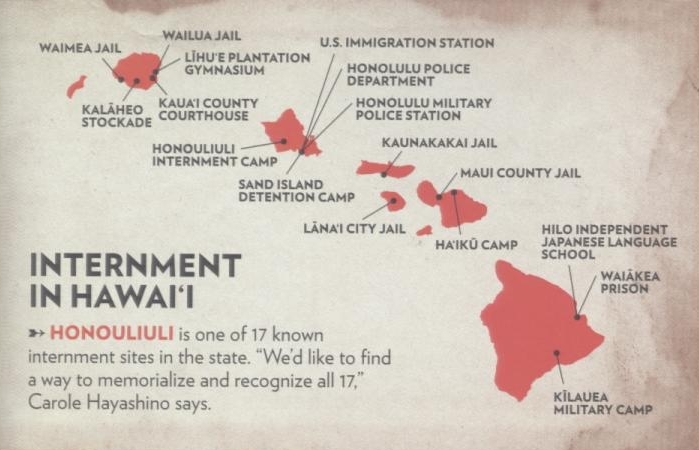 Map from "Finding Honouliuli" by Katrina Valcourt, Honolulu magazine, June 2015, pp. 44-47. Courtesy of the Japanese Cultural Center of Hawaiʻi.